How to continuously deploy web application to Azure VM Scale sets using VSTS and Packer? Azure VM Scale sets are a great way to deploy identical set of VMs (based on same VM image) in true autoscale. When one wants to change a application deployed to VM Scale sets, one common approach is to bake a new VM Image with the latest application code built in, and then update the VM scale set to use this modified image. Performing this task manually can be error prone, time consuming, and often only few individuals in the team can perform this task. In this post we see one way in which we can set continuous deployment to an environment (called QA in the sample) when using VM scale sets, which means that every time the application is modified and code is merged in the configured git branch, the latest application is deployed to the VM Scale set. The Visual Studio Team Services (VSTS) release pipeline shown in our example can be enhanced to include more environments including production. We use packer in our release pipeline to continuously bake the VM image with latest application code, each time there is an application update. For details of configuring packer with Azure you can refer to my post using Packer with Azure . The sample application code (php web application), the build / release scripts (including packer file, UI and load test files), and the VSTS release template can be found at my github repo. Will give overview of the solution before diving into into some of the details. The VSTS build is triggered each time code is merged into the master branch of the repository. The VSTS build in the sample is a simple one which just publishes files needed for the release. Successful build then triggers a release. The first step of the release packages the latest application files into an Azure VHD image using packer, this VM image (vhd) is stored in the configured storage account. Next we use the azure cli group deployment command to push the new VM image (with latest application code baked in) to the VM Scale set. The last two steps are for UI testing (Using php unit and selenium in this case), and Load testing (using JMeter). At the end of each successful release, the VM scale set has the latest application code. 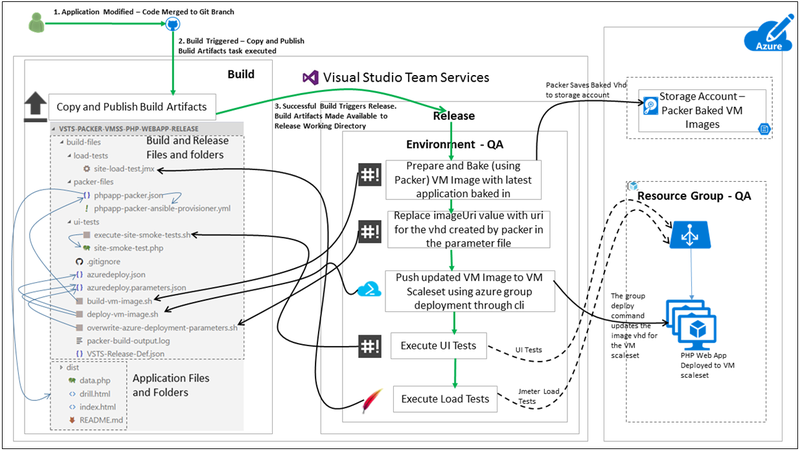 Please Note : The VSTS VMSS task and VSTS Packer tasks are now available, The deployment pipeline is much more simpler if these tasks are used together. See the Post on how to use these tasks together to bake custom VM Image and update VM Scale Set Image. Now let us dive into some of the details of our build and release configurations. Configuring the custom agent to execute Packer: Information on installing latest Packer executable can be found at install packer. The script below shows installation of packer version 0.12.0 . Configuring the custom agent to execute phpunit and selenium scripts: Follow the link to install phpunit (only if you are using a php based application) and then you can move it to /usr/bin/phpunit. You can use the link to install firefox. You can use the link to install xvfb and selenium stand alone as a service. Once these tools are installed on the agent, we are good to configure the release pipeline. Build configuration : For simplicity the build is configured to publish all files are folders in the repository. A new release is configured to be created on each successful build. Following are the environment variables which are configured for the release. The ARM_CLIENT_ID, ARM_RESOURCE_GROUP, ARM_STORAGE_ACCOUNT, ARM_SUBSCRIPTION_ID, and ARM_TENANT_ID are used by packer to save the baked VM Image VHD into the configured Azure storage account. ADMIN_USERNAME, and ADMIN_PASSWORD are the the logon credentials for the VM scale set VMs. DEPLOYMENT_RESOURCE_GROUP is the resource group where the VM scale set is deployed. These are passed to the different tasks in the release (as we will see when we go through each task in detail). Replace image uri in ARM template deployment parameters file, with uri of vhd generated by packer in preceding step. Note : The VSTS VMSS task is now available, if the VSTS Packer task is used along with the VSTS VMSS task then this step and the next step "Push updated VM image to VM scale set" may not be required. See the Post on how to use these tasks. Push updated VM image to VM scale set using Azure Cli group deployment: This is done by using the Azure cli task which calls the deploy-vm-image.sh file and passes the resource group where the VM Scale set is deployed. Execute Selenium based Smoke test on Application. The JMeter Load test execution task then fires JMeter Load Tests against the site site using the JMX file site-load-test.jmx (which has duration assertions) . In the sample used for this post all tasks are executed the same QA environment. This Release configuration can be enhanced by adding other environments like Performance and Volume Testing envrionment (where the load test can be moved), etc. Thanks for reading my blog. I hope you liked it. Please feel free to write your comments and views about the same over here or at @manisbindra. Excellent article! !, Thanks for sharing.. I wanted to know whether this will require any downtime? If yes, how to do it without requiring any downtime? Thanks Pratik. You can have a look at https://docs.microsoft.com/en-us/azure/virtual-machine-scale-sets/virtual-machine-scale-sets-upgrade-scale-set . Assuming that the upgrade policy of you VMSS is set to manual, it is possible to update VMSS VMs one or few at a time, so without downtime. The down time will also depend on the design of your application, i.e. whether the clients consuming the services deployed to VMSS can handle the scenario where VMs in VM Scale set have 2 different versions of the services deployed (for a few minutes). Hope that answers your question.